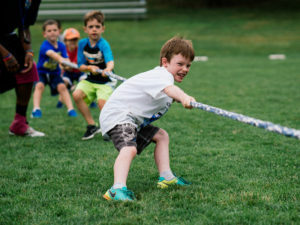 Campers, ages 3-14, come to us from public and private schools throughout New York City, Westchester and Connecticut. Graduating campers (ages 15-16) are invited to attend our CIT, Counselor-in-Training Leadership Program. We have developed a unique, progressive swim curriculum. Campers are grouped by age and skill level. Instruction spans all skill levels – from the basics of water adjustment for beginner swimmers to stroke refinement and competitive swimming techniques. We have one small-group instructional period and at least one recreational swim each day. Our swim graduation requirements are pretty impressive! 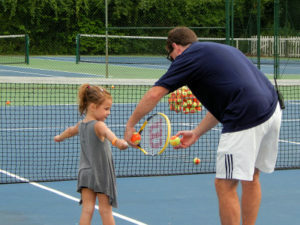 Campers come to love tennis when they are taught fundamentals, basic strokes, court play and etiquette by engaging, professional instructors. Whether it be for camper bonding, group-to-group challenges or just plain old fun, we revel in our classic camp activities and games. 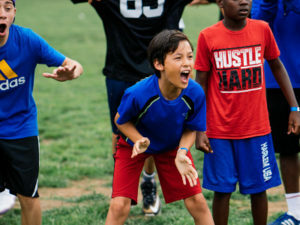 One week per summer, Color War offers campers the chance to cut loose, compete and bond together, regardless of age or skill level. For many, Color War is the highlight of the whole summer. In addition to our popular archery and skateboarding programs, we take children hiking and exploring around our 38-acre campus. Each week at camp, there is a different tournament. Children, who choose to participate first join a clinic to buff up their skills before the games begin. Over the course of the week, they compete in exciting games that culminate in a championship. Players are grouped into age-based divisions, so that everyone plays at an appropriate level. We pride ourselves on the importance of winning gracefully and losing with dignity. Each group 7 years and older also participates in their own sports league that runs throughout the summer. For example, our 7 year-olds played a 57-inning baseball game that lasted for 4 weeks. Each week, campers have the opportunity to play in a tournament after they complete a skill clinic. The competition is exciting as are the championships of the multiple age divisions. We pride ourselves on teaching the importance of winning gracefully and losing with dignity. Each group also participates in their own sports league that runs throughout the summer. One of our most notable is when the 7-year-olds played a 57-inning baseball game that lasted for 4 weeks.